For some reason, Google's caching feature is more and more difficult to use. The "cached" link is hidden inside the Instant Preview box and it's no longer available in the mobile interface. - click the "similar" link in the Instant Preview box instead of clicking "cached"
- replace "related" with "cache" in the URL and press Enter. If there's no "similar" link, you can copy the query, go to the cached page and paste the query in the address bar between "+" and "&cd=". There's also a cool Chrome extension called MultiHighlighter, but you need to copy the query, visit the page, press Ctrl+Shift+A and paste the query. If you use Internet Explorer, Google Toolbar has a cool highlighting feature. I also found that adding the keyword to the end of the regular cache query will highlight the keywords on the cache page. This works both while being signed in and in incognito mode. 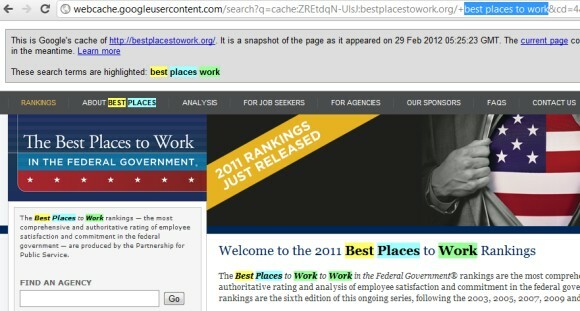 I have a Quick Fix to Bring Back Keyword Highlighting to Google Cache. Here: http://minus.com/mtQxtGqEB Feel free to modify it ! It's still in testing, so feedback is very much welcomed.